A diode is a two-terminal semiconductor electronic component that exhibits nonlinear current-voltage characteristics. It allows current in one direction at which its resistance is very low (almost zero resistance) during forward bias. Similarly, in the other direction, it doesn’t allow the flow of current – as it offers a very-high resistance (infinite resistance acts as open circuit) during reverse bias. The diodes are classified into different types based on their working principles and characteristics. 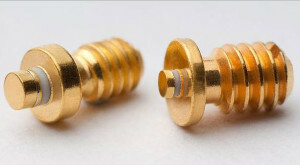 These include Generic diode, Schotty diode, Shockley diode, Constant-current diode, Zener diode, Light emitting diode, Photodiode, Tunnel diode, Varactor, Vacuum tube, Laser diode, PIN diode, Peltier diode, Gunn diode, and so on. On a special case, this article discuss about Gunn diode’s working, characteristics and applications. What is a Gunn Diode? A Gunn Diode is considered as a type of diode even though it does not contain any typical PN diode junction like the other diodes, but it consists of two electrodes. This diode is also called as a Transferred Electronic Device. This diode is a negative differential resistance device, which is frequently used as a low-power oscillator to generate microwaves. It consists of only N-type semiconductor in which electrons are the majority charge carriers. To generate short radio waves such as microwaves, it utilizes the Gunn Effect. The central region shown in the figure is an active region, which is properly doped N-type GaAs and epitaxial layer with a thickness of around 8 to 10 micrometers. The active region is sandwiched between the two regions having the Ohmic contacts. 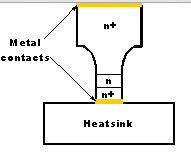 A heat sink is provided to avoid overheating and premature failure of the diode and to maintain thermal limits. For the construction of these diodes, only N-type material is used, which is due to the transferred electron effect applicable only to N-type materials and is not applicable to the P-type materials. The frequency can be varied by varying the thickness of the active layer while doping. It was invented by John Battiscombe Gunn in 1960s; after his experiments on GaAs (Gallium Arsenide), he observed a noise in his experiments’ results and owed this to the generation of electrical oscillations at microwave frequencies by a steady electric field with a magnitude greater than the threshold value. It was named as Gunn Effect after this had been discovered by John Battiscombe Gunn. The Gunn Effect can be defined as generation of microwave power (power with microwave frequencies of around a few GHz) whenever the voltage applied to a semiconductor device exceeds the critical voltage value or threshold voltage value. Gunn diodes are used to build oscillators for generating microwaves with frequencies ranging from 10 GHz to THz. It is a Negative Differential Resistance device – also called as transferred electron device oscillator – which is a tuned circuit consisting of Gunn diode with DC bias voltage applied to it. And, this is termed as biasing the diode into negative resistance region. Due to this, the total differential resistance of the circuit becomes zero as the negative resistance of the diode cancels with the positive resistance of the circuit resulting in the generation of oscillations. This diode is made of a single piece of N-type semiconductor such as Gallium Arsenide and InP (Indium Phosphide). GaAs and some other semiconductor materials have one extra-energy band in their electronic band structure instead of having only two energy bands, viz. valence band and conduction band like normal semiconductor materials. These GaAs and some other semiconductor materials consist of three energy bands, and this extra third band is empty at initial stage. If a voltage is applied to this device, then most of the applied voltage appears across the active region. The electrons from the conduction band having negligible electrical resistivity are transferred into the third band because these electrons are scattered by the applied voltage. The third band of GaAs has mobility which is less than that of the conduction band. Because of this, an increase in the forward voltage increases the field strength (for field strengths where applied voltage is greater than the threshold voltage value), then the number of electrons reaching the state at which the effective mass increases by decreasing their velocity, and thus, the current will decrease. Thus, if the field strength is increased, then the drift velocity will decrease; this creates a negative incremental resistance region in V-I relationship. Thus, increase in the voltage will increase the resistance by creating a slice at the cathode and reaches the anode. But, to maintain a constant voltage, a new slice is created at the cathode. Similarly, if the voltage decreases, then the resistance will decrease by extinguishing any existing slice. The current-voltage relationship characteristics of a Gunn diode are shown in the above graph with its negative resistance region. These characteristics are similar to the characteristics of the tunnel diode. As shown in the above graph, initially the current starts increasing in this diode, but after reaching a certain voltage level (at a specified voltage value called as threshold voltage value), the current decreases before increasing again. 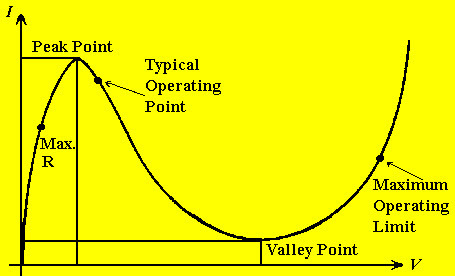 The region where the current falls is termed as a negative resistance region, and due to this it oscillates. In this negative resistance region, this diode acts as both oscillator and amplifier, as in this region, the diode is enabled to amplify signals. Used as Gunn oscillators to generate frequencies ranging from 100mW 5GHz to 1W 35GHz outputs. 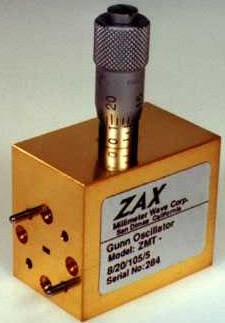 These Gunn oscillators are used for radio communications, military and commercial radar sources. Used as sensors for detecting trespassers, to avoid derailment of trains. Used as efficient microwave generators with a frequency range of up to hundreds of GHz. Used for remote vibration detectors and rotational speed measuring tachometers. Used as a microwave current generator (Pulsed Gunn diode generator). 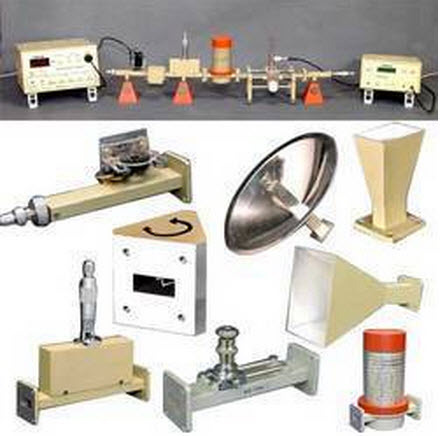 Used in microwave transmitters to generate microwave radio waves at very low powers. Used as fast controlling components in microelectronics such as for the modulation of semiconductor injection lasers. Used as sub-millimeter wave applications by multiplying Gunn oscillator frequency with diode frequency. Some other applications include door opening sensors, process control devices, barrier operation, perimeter protection, pedestrian safety systems, linear distance indicators, level sensors, moisture content measurement and intruder alarms. We hope that you have got an idea of the Gunn diode, characteristics of Gunn diode, Gunn Effect, Gunn diode oscillator and its working with applications in brief. For more information regarding the Gunn diodes, please post your queries by commenting below. I want to know if are gunn diodes that are working at 0.5-0.9 ghz. Gunn diode operation modes are TT mode and LSA modes. These are two modes which bring Gunn diode into oscillation region. TT mode stands for Transit-Time mode and LSA mode stands for Limited-Space Charge mode. When the voltage across n+ n n+ GaAs crystal exceeds the threshold voltage, electrons are transferred from (low energy, high mobility band) to (high energy, low mobility band). Here heavier electrons bunch together to form electric field near the cathode. 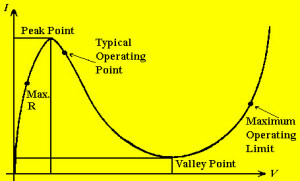 The TT mode of oscillation has low efficiency of power generation. In this mode, the frequency cannot be controlled by an external circuit. LSA mode in Gunn diode produces several watts of power at a minimum efficiency of about 20%. The output power decreases with increase in frequency. For example, it generates 1Watt @ 10GHz and several mWatts @ 100GHz. In LSA mode of operation, Gunn diode works as part of a resonant circuit. very very good or excellent information about the gunn diode.I want to very very thank you. Nice information.I really like it. fully satisfied with thiss. . . .
Nice infromation.Short and sufficient.Thank you. It is useful.and we can gain more information.